Remember how I told you that I had grounded myself from yard sales until my bathroom was finished? Yeah, well I jumped ship on Saturday morning. It had been a long, hard week with my husband gone a lot and the only "me" time I was going to be able to sneak in was Sat morning before 9 a.m. I also had some birthday money from my grandma burning a hole in my pocket. What's a girl to do? There weren't too many sales since the wind was blowing like crazy. 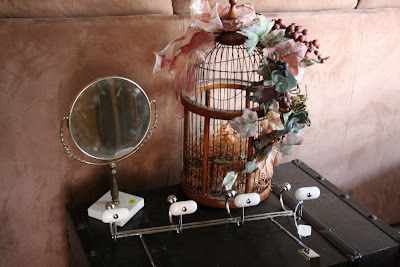 I went to three and managed to find this over the door hanger, bird cage (do you see the potential on this one?? ), and mirror for $3 total. Not a bad morning, but not the best. I was on my way home when I saw a sign for a feeder sale (what am I talking about? 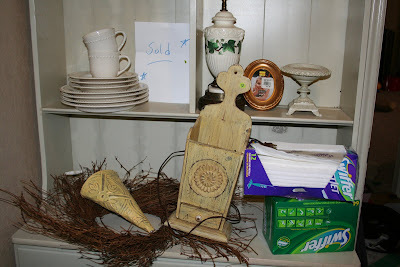 see my yard sale 101 posts here) just a few blocks from my house. Of course I stopped, and they had some of the best stuff! I couldn't believe it. 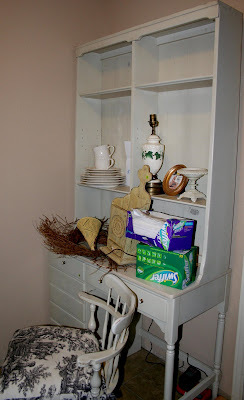 white Pottery Barn dishes, an lamp with great potential, a frame, a candle holder, a wreath, a cute yellow tin, a wooden wall hanging thing with a drawer, and a bunch of Swiffer refills. And, do you see the beauty they're sitting on? It's a gorgeous white Ethan Allen desk set~ all wood, came with the chair, the toile chair pad, and a nightstand that's not in the picture. It has some handles missing and a few of the shelves were gone, but it was in great shape. "how about $35 for everything? We really want everything gone since we had it yesterday too." Me: "You had it yesterday and you still have all this left?? What did you have yesterday?" Him: "Oh, we sold a lot~some furniture, lots of fabric, curtains, some old doors, lots of decorative stuff. We're getting ready to move and just don't want to pack a lot." I asked him to hold it all for me while I ran home and measured really quickly. We don't have the space in my girls' room right now, but I knew I couldn't pass up such a great piece of furniture and I had an idea of where it could go. Ran home, measured, did a little dance of joy that it was a perfect fit, grabbed some more cash, and ran back and handed over the $35. Another lady had pulled up and cleaned them out of everything I didn't get. I can't wait to get my hands on all of it, but I am going to work on the bathroom now. For reals. Wow.wow.wow. Those are some fabulous finds. Our garage sales have been slim-pickins so far, I could only dream of finding one that good! Congrats! What an amazing haul! I got a few little thrift store goodies this weekend, but I have yet to land a stash like that! I still can't get over $35.00!!!! Unbelievable! Can't wait to see them turn up in future photos! I'm inspired. Have a great week! Wow, I cant beleive you got all that stuff for less than 40 dollars. You really scored. I love a good yardsale. Man! I keep checking the paper, but no yard sales are around here yet! Your finds really have me inspired to get out there! You got a deal on the desk. I have my Ethan Allen desk and chest with shelves just like that, my parents bought it for me when I was 10. I have used it in many different rooms in apartments and homes through the years. Lucky, lucky you! Sweet deal! What great finds! I'm moving to your town!! You know how King Agrippa said to Paul "Almost thou persuadeth me to become a Christian"? Well, after seeing this post I am almost persuaded to try my hand at yardsaling! In fact, I have just tipped over the edge and I am going to jump in with both feet! I'm going to go to a yardsale! Thanks for all of the tips and motivation! Wow! Phenomenal deals! Good for you! I've said it before and I'll say it again--the spirit follows you to your yard sales!! :) Great finds! Can't wait to see what you do with it all! LOVES! That a deal! I can't believe you got the desk (plus the rest) for $35. Ok,after reading this I have definitely caught the yard sale bug! Haven't done much in the past, but what inspiration!! Love all of your posts. Keep it up! WOW! What a haul! I never get lucky enough to find good furniture like that. Everything I find is cheap particle board junk it seems. What great stuff you got! I wish I could run into a yard sale like that. I can't wait to see what you do with it. Keep us posted! Great finds! I can't wait for the weather to get nice for garage saling! LUCKY!!! Nobody even has yard sales around here yet. It's too cold. And I'm soooo jealous of that bird cage. get out! $35 for the Ethan Allen desk! Way to go! I am so jealous!!! Our garage sales haven't started yet. You're making me very excited! Hope some of your luck comes my way. ohmygoodness...you had a great day! i paide $60 for the same desk on CL lat year, and thought I got a deal! Wow. you gotta a lotta great stuff,, i've been dying to go and am really hoping to be able to this saturday,, just wanted to say that the little wooden thingy with the drawer looks a lot like a match holder that my grandmother had when i was younger,, it held a big (like a 3inx5in box) of matches,, that may not be what it is but it looks an awful lot like the one she had. Great find (and deal - wow!) 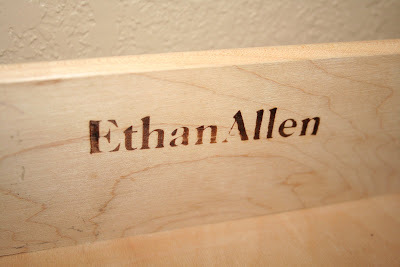 on the Ethan Allen - we all know their stuff is expensive but so well made. Fun fun - aren't you glad you went? I love yard sales! You lucky girl!! That desk is fabulous!! Wow...all that for $35? You scored big time girl! Oh how I LOVE yard sales. Well hey- nice to meet you- and you are quite funny! Don't you just love a good yard sale? I am loving that bird cage- definitely lots of potential there! I am addicted to yard sales to. I love finding great deals and little treasures. Those are some awesome finds! I can't wait to hit the yard sales. Snow has really put a damper on my thrifty shopping!